Rosy Outlook: My Take on Athleisure + FF Link-Up! My Take on Athleisure + FF Link-Up! Happy Wednesday friends! Hope you're having a great week so far. I definitely have been riding the struggle bus after having those few days off for Thanksgiving. I also think my body is still adjusting to waking up earlier to go into the office after working from home every day for the last 4 months! It really is so nice to be back in an office setting around people again though so I can't complain. As I'm planning out my posts for the month of December, I would love to know what y'all are interested in seeing from me in the blog. I will probably do a poll on Instagram but I also wanted to get your opinions here! I definitely will be doing several gift guides but would you guys also be interested in seeing holiday recipes? Maybe a post on decorating a smaller space for Christmas since we're back in an apartment? Let me know in the comments! I definitely have the goal for 2019 to expand my content more and get more creative. This year was obviously a tough one with a lot of changes so it has been hard to put a lot of focus on creating new content but I think next year I want to make it a big priority! I so much enjoy the athleisure look, you've done a fabulous job with it. The way your hat, scarf and hair are framing your face makes for a stunning photo. Absolutely cute as all get it! Love that buffalo plaid scarf! I am ALL about the athlesiure! It's so comfy and looks so cute. I love the all black with the pop from that scarf...which by the way looks so cozy! I'm loving your take on athleisure- the sneakers are too cute and your beanie is everything! Obsessed with this look! I love that its comfy but looks so chic at the same time! That hat is adorable! I adore your take on athleisure. The scarf and beanie are perfect!!! Such a cute athleisure outfit! Love your hat and scarf! Your outfit is super cute! That scarf looks so cozy! I love your cozy scarf and those tennis shoes are so chic! Great look! Such a cute outfit, I love the hat and shoes! This is such a cute and cozy look dear. Love your scarf! so obsessed with this whole vibe girl!! I am obsessed with this outfit! 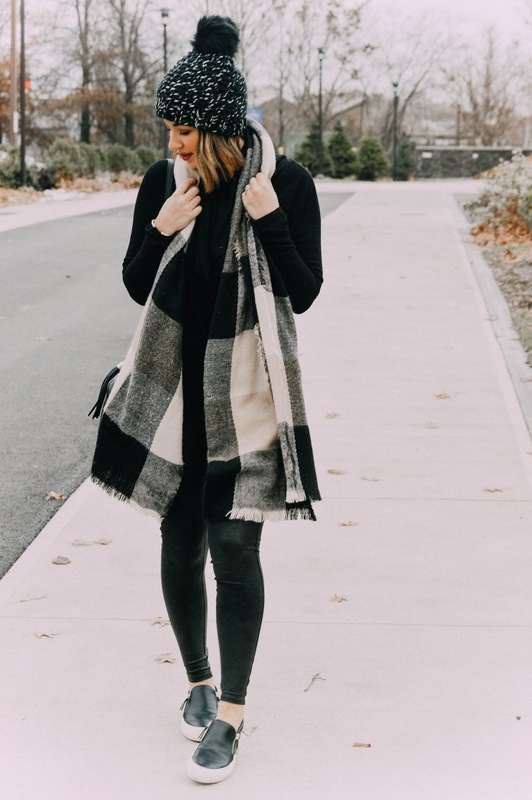 The all black is so sleek and the scarf is so perfectly cozy! Snuggly AND stylish. Yes to that. Keep warm, x.